Christmas might seem like decades away but it took place in February for designers all over Europe as they flocked to Christmasworld, one of the continent’s largest trade fairs and a true reflection of upcoming trends and not just for the festive season. We were there to spot not only butterflies by the bucket-load but also faux feathered birds and in bright clashing colours which made an appearance at exhibits featuring upcoming interior and décor trends. So to tantalise your inner child why not take a leaf out of the designer duo’s book and bag yourself some loud and proud products like the new feather butterflies, colourful butterfly brooch pins, fluffy or sleek flutter feathers and for some seriously loud clashing colours use Bling it on stickers or Amazing glitzy wraps which can be used to cover anything and everything in enough dazzling colours to cover the eyes. Top it all off with their selection of metallic or bullion wire which comes in a whole range of bright colours to bring the theme through to every element of your design. Our new feather butterflies are light enough to be glued or wired to any design be it wristlets for prom-goers, fun hand-tieds going out as gift orders, perched atop your spring plants or among wedding work for the fun bride not afraid of a bit of fun and colour. Or opt for the white glitter alternative for a subtler touch, and all are available in two sizes. Browse it all online at corsagecreations.co.uk, and flick through our latest catalogue here. 1. Get out there and sell your­self! Proms are a rapidly expand­ing mar­ket thanks to US film and TV. Young Brits are keen to match their Amer­i­can coun­ter­parts with a big­ger and bet­ter bash each year, but many stu­dents aren’t aware of how many excit­ing options are avail­able to them. So the best way to make your­self and your offer­ings known is to actu­ally go out and visit schools. Hand out fly­ers, show off exam­ples, and even hold ‘have a go’ ses­sions if schools allow it. 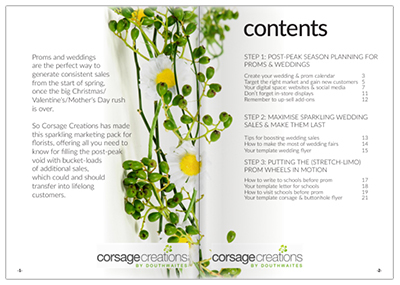 Check out our mar­ket­ing pack for more ideas. 2. Offer some­thing for every­one. We have a mahoosive range of cor­sage bracelets in styles to suit all. Stu­dents will be clam­our­ing to bet­ter each other with cus­tom cor­sages, so let each of their per­son­al­i­ties shine through with designs for every­one from punk rock­ers to pretty pink princesses. Grab your­self a Prom Starter Pack at just £100 trade price for bracelets, acces­sories and a dis­play rack. 3. Don’t waste mar­ket­ing oppor­tu­ni­ties. Renowned florist Neil Whitaker swears by prom PR tac­tics, his win­dow dis­play and social media are key. Have fun cre­at­ing a prom win­dow to pull passers-by inside, and make sure you pho­to­graph it as well as all your funky cor­sage and but­ton­hole ideas to share share share away. Most teens’ eyes are glued to a screen 24⁄7 so social media is an essen­tial route to pick­ing up prom sales. 4. Set up a pick n mix prom bar. Florists who tried this last year said it worked won­ders for cor­sage sales because eager teens loved being able to pick and choose each aspect of their cor­sage. With a box for bracelets, rib­bon, sparkly acces­sories and more you’ll cre­ate an in-store buzz and inspire those future flower buy­ers. Get your cor­sage dis­play stand here. 5. Cus­tomise cor­sages to the max. Fill your prom bar with a range of add-ons so each stu­dent can feel super spe­cial on the big day and you can add value to designs. We have a huge range of acces­sories from Bling it On Stick­ers and Cloud 9 Feather Accents to sub­tler gold Chic Leaves and green Cor­sage Leaves. You can even help young love blos­som with spe­cial his and hers cor­sage and but­ton­hole cou­ples sets. 6. Take advan­tage of your tar­get mar­ket. Young minds are eas­ily inspired and many mums and dads will be will­ing to splash out to make the first prom oh-so-special for their lit­tle dar­lings. Teens are much more likely to show off and go wild than your aver­age adult flower buyer, so really push your extrav­a­gant designs and use prom sea­son as an oppor­tu­nity to let your cre­ativ­ity run wild. You’ll find tons of inspi­ra­tion on our YouTube channel. Arti­cle cre­ated in col­lab­o­ra­tion with Purple Spotted Media.